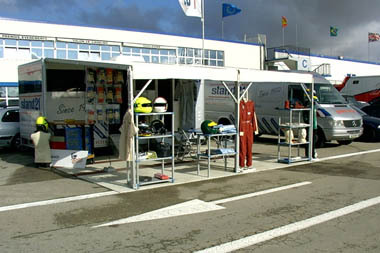 The 2005 racing season has now started. Formula 1 GP, Daytona 24 hours, WRC, the fight for victory is on and we are committed to satisfy all your needs in comfort and safety. Because our job is not only to sell racewear, but also to offer you the best products implies numerous hours in our R&D development as well as a constant collaboration with the highest authorities in motor racing and the medical teams. To offer you the best service also means being present where you need us the most: on the racing tracks with our teams (schedule available here) or near you with a network which is spreading with the grand opening of Stand 21 Scandinavia and of Stand 21 Spain. Have a great 2005 racing Season and see you soon on a racing track! The Dijon HQ shop is now open on Saturdays ! Contrary to what is written on the Stand 21 2005 catalogue, special designs for MC2 and K09 overalls are available from 1 piece. In a general way, please refer preferably to the website to be sure to get the most up to date information. Once again, we were present at the Autosport Show (13 - 16 January, Birmingham, UK). We held 2 major meetings on 2 very sensitive subjects: The Hans® Device and the Heat stress. These 2 different research programs which were lead with the medical help of MD Terry R Trammell, Professor Claude Meistelman, and Docteur Paul Trafford were extremely successful and showed us we were going in the right direction; feel free to contact us anytime to get more details. We will be trackside, in total at over 200 races worldwide, find the provisional calendar here. Numerous articles around the world have already spoken about the Hans® Device and our R&D department, which has fitted this system at numerous races, is regularly sought as a technical advisor. In a new level of research with the best medical teams in the world, we have put at the disposal of certain medical teams with whom we work, a set Hans®/Helmet for extraction training. Please, also note that the Hans® air padding which we have developed has been tested at Daytona during the Rolex 24 Hours by Emmanuel Collard, who won the race. 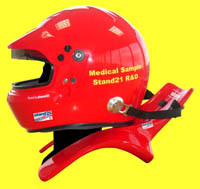 We are regularly sought by F1, DTM, WRC, FIA GT, WTCC... to help them fit the Hans® to their needs when they test. Feel free to contact us anytime if you have similar needs. The "New generation" ST3000 racing suits are being developed: we are actually testing several breathable & stretchable raw materials in laboratories and in racing cars. The global research program we have on the Heat Stress problems has lead us to develop the special Daytona "Heat Transfer" boots which are actually being tested in the US. Because it is now obvious to all the authorities that the Hans® is a safety device as important as the helmet and the racing suit, the championships in which it has become compulsory are now more and more numerous. 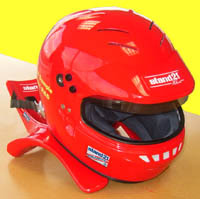 It is the sole head and neck protection authorized in NASCAR and its use has just been made compulsory in Formula BMW and in Formula Renault 2.0. The FIA in collaboration with Stand 21 has only just refined the standard for the gloves, which has delayed the production process for the new generation of gloves. We remind you that the new standard will come into force at the end of the year and will be the only authorized in the FIA races from 01/01/2006. The sales of the ST2000 stretchy suits have increased at the start of the year by 50%. The awareness of the drivers towards the Heat stress is the reason why they chose this "total comfort" suit, and the sales should keep on increasing in the following months. We offer you now a 5 colours choice for your chrome helmets (red, orange, yellow, blue, grey); moreover, the Sun breaker visor of which we spoke about in the last newsletter are now available. You can get the AXV 3000 boots from now! The network is getting larger by the day, after the grand opening of Stand 21 China end 2004, Stand 21 Scandinavia should open in April and be able to give you the best advice on your equipment. We are also ready to open Stand 21 Spain, we will talk about it in the next newsletter. Our priority is the quality of service we offer to our customers. This is the reason why we have a very close relationship with our distributors.